It’s playoff time again, which means it’s also time for our Breaking It Down series. That’s where I – and I alone – take a look at the post-season matchups and provide is a snapshot of the action to come. This edition features a look at the second round matchup between the Pittsburgh Penguins and the Washington Capitals. Game One is on Thursday. Sidney Crosby and Alex Ovechkin. Alex Ovechkin and Sidney Crosby. This is the matchup everyone’s been waiting for, even if the two superstar captains are downplaying the importance. The Penguins and Capitals are the two biggest teams in the Eastern Conference and Crosby and Ovechkin are the two biggest stars in the league, but it should be business as usual for the principal players. Crosby left the first round with eight points in five games, including three goals. He had five points on the power play and registered a dozen shots on goal. Ovechkin had five points in six games against the Philadelphia Flyers. He also had three goals, with three power play points and 29 shots on goal. Washington netminder Braden Holtby was one of the most impressive goaltenders of the entire first round, posting a 4-2 record with a 0.84 goals against average and a .968 save percentage. He had two shutouts against the Flyers, but he only faced 154 shots across six games – including a measly 11 shots against in Game Five. The downside? The Flyers won Game Five by a final score of 2-0. Marc-Andre Fleury is still listed as day-to-day by the Penguins and I wouldn’t bet on him returning for the second round. That likely puts Matt Murray in the driver’s seat again. He missed the first two games of the series against the New York Rangers, but he won all three games he started and has a 1.33 goals against average with a .955 save percentage. He also picked up a shutout. Jeff Zatkoff was 1-1, with a 3.08 goals against average. The Penguins are dangerous on the blueline. They’re healthy and they have considerable depth. Kris Letang registered five points in five games and had 11 shots on goal. He logged over 30 minutes on April 16 and notches over 25 minutes a game on average. Olli Maata is his defensive partner, but he didn’t manage a point and seemed a slow starter in the series. Trevor Daley averaged 22:41 of ice time and skates well with Brian Dumoulin. The Capitals have received some defensive punch of their own thanks to the play of John Carlson, who averaged almost 25 minutes of ice time and led Washington’s blueliners with six points. 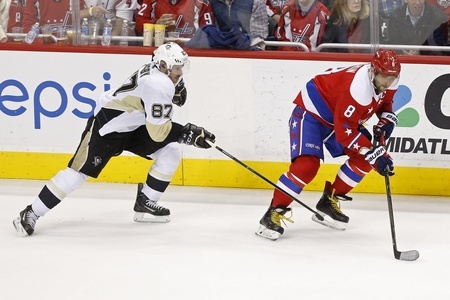 Matt Niskanen had over 25 minutes of ice time a game and registered two points in six games. Because of the injury to Brooks Orpik, Nate Schmidt was moved up in the depth chart. The 24-year-old picked up an assist. While Ovechkin propelled the majority of Washington’s offensive muscle, the supporting players did well. Nicklas Backstrom had seven points in six games, with 14 shots on goal. He was also instrumental in shutting down Claude Giroux. T.J. Oshie had four points in six games, including a two-point performance on April 18. There were questions about where Evgeni Malkin would fit after returning from injury, but the 29-year-old wasted little time addressing that matter. He finished with seven points in four games, cracked off 10 shots on goal and nearly logged 20 minutes on April 16. In all likelihood, Malkin will start the second round with Chris Kunitz and Eric Fehr. There’s also the Phil Kessel factor, as he had six points – including three goals. This should be a doozy. The Capitals and Penguins should have no problem living up to their marquee billing in the second round and it’s not unreasonable to expect a shooting gallery. Ovechkin and Crosby will be firing on all cylinders and both clubs have plenty of secondary options to take the series to a potential sixth or seventh game. In the end, however, goaltending should be the difference. The Penguins are still looking for stability and the absence of Fleury could hurt. The play of Holtby has the potential of swinging the series in Washington’s favour. With the available facts in mind, I’m giving the edge to the Capitals in seven games.